Today has been a busy day! Finally got into my chiropractor & upgraded to the unlimited visits for the month of February. He is very reasonable, it is only $240 for our entire family for the whole month with unlimited visits each! Ahhhhh! I’m already feeling relief! I just can’t go so long without getting adjusted anymore. My back has been so damaged for so long, it’s just going to have to be a part of my health routine from now on, like going to the gym or exercising. Then after this month I should be able to go back to weekly visits. Harold got to come home this morning too, it was an unsuspecting pleasant surprise. The out of town job he was on this week delayed. So we got to spend some time together today with Stormy running errands. We are thankful for the jobs, even though he is having to work out of town for 1-2 weeks at a time, it will help us finish getting ready for the move to Oregon in a few months. We are thankful to have been able to pay off a large bill today because of it, that we needed to get taken care of. Thank you Lord! Just a few more to go and we will be debt free (everything but student loans) before we leave. Got my onions replaced today. The one on the left has been out for about a week. 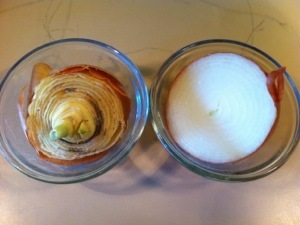 the one on the right is the fresh cut onion. For those that don’t know, we help stay cold & flu free by placing an unpeeled onion cut in half in glass dishes throughout the RV. It only takes one onion cut in half for us. The onions absorb the cold/flu germs. We’ve done this for two years now & it works quite well. I prefer the sweet onions as they do not have as bad of an “onion” smell. The cheap onions can sometimes have a very pungent oder. But it is worth a little onion smell for a day to not get sick. 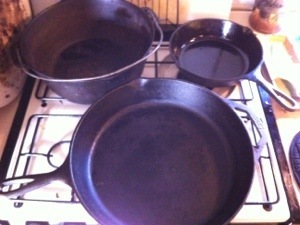 I also got my cast iron pans cleaned & oiled. I don’t use any soap on them, but sometimes I do need to use a little hot water & my scrubber and rinse them out. I then put them on the burner to heat them up till all the water has cooked off then turn the burner off. While it is still hot I give it a good rubbing with olive oil. I’ve heard some say not to use olive oil because it makes your food stick, but I’ve had really good luck with it. I cook exclusively with extra virgin olive oil now and I can usually just wipe the pan out with a clean towel when I’m done. I’m loving cooking with my cast iron. I even tried my hand at homemade mayonnaise & ranch dressing today. The mayonnaise didn’t work out though. I used my extra virgin olive oil & the flavor was just way too strong. I’ll need to see what other lighter flavor oils are on the health food shelves. I want to use an organic oil as we are trying to get away from commercially processed foods, GMO’s & chemicals. But, I got the blending good though as it was light & creamy, just tasted awful. Lol. Now my ranch turned out really good. Stormy helped me mix it up & it is Stormy & Daddy approved. So at least we had that success today. Ill post the pics and recipes first of next week as the rest of this weekend will be very busy. Tomorrow we start early as we head to a class to learn to process different animals and learn to tan hides the natural way using no chemicals. I plan on taking lots of pictures, videos & notes. Then Sunday we are off to my sister’s to celebrate my niece’s first birthday. Holly is coming to visit & go to the party with us. So we will have an awesome, but very busy weekend. Hope everyone has a wonderful weekend too! This entry was posted in Blog and tagged Chiropractor, Family. Bookmark the permalink.